This month Best Buy added QR codes to the fact tags in all their U.S. retail stores, making them the first national retailer in the US to embrace their shopper’s desire to use mobile devices during their shopping trips. This is the latest in a series of savvy moves by the retail giant to pioneer the integration of social networks and mobile marketing with their brick- and-mortar retail experience. According to an InsightExpress study, 82% of consumers already use mobile phones during their shopping trips, so it’s critical that retailers understand and embrace this new shopping behavior. QR codes are a specialized version of a two-dimensional bar code. QR codes are intended to be scanned by the camera on a mobile phone, providing a fast and easy way to transfer information. The phone uses a reader application to recognize the QR code and convert it to a small amount of data (i.e. the payload). Common payloads include V-Cards (for contact information), text, and most commonly a URL pointing to a mobile web page. A code on a business card can allow a user to add a contact to their address book, a code on a shipping container can allow an inventory control device to quickly receive goods, and a code on the edge of a retail shelf can take a shopper to a mobile website that gives rich product information about a potential purchase. 2D barcodes (also called matrix codes) can contain more information than a traditional one-dimensional barcode. They are also easier to read at various angles, difficult lighting conditions, as well as for device cameras with limited focusing capabilities. There are several different flavors of 2D bar codes, but the two that are most prevalent in retail stores are the QR Code format and Microsoft Tag format. The Microsoft Tag offers some technical advantages over QR Codes, but they only work with readers provided by Microsoft. It’s currently free to create and use Microsoft Tags, but there is no guarantee that it will always be free. QR codes have no licensing restrictions, so they will always be free, and are supported by a variety of readers. Google has built support for QR Codes into its Android mobile operating system, and Google prints QR Codes on its Google Places window decals. Tellingly, however, Microsoft doesn’t use Tag in either their own retail stores or their popular iPhone and Android Bing applications. Microsoft’s support for its own technology seems half-hearted. 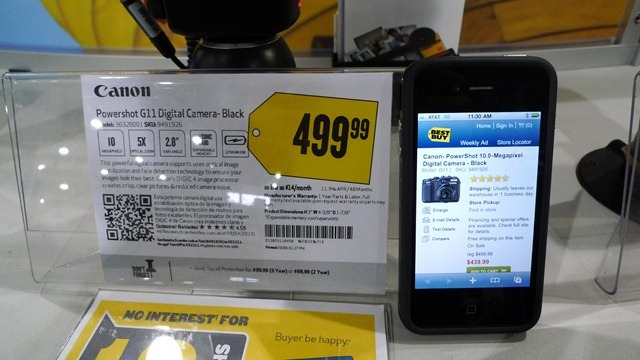 Now that Best Buy has embraced QR Codes, it is likely to be the dominant format used at retail. Today, QR codes represent the best way for an in-store marketer to connect the real world with digital content on a shopper’s mobile device. However, they do require some level of education and intervention on the part of the user, such as downloading an OS-specific app. In the long term, Near Field Communication (NFC) is a technology that, if widely adopted and implemented on mobile devices, could provide a seamless shopping experience. 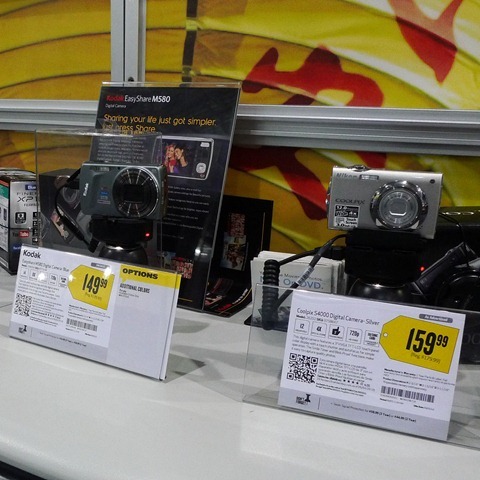 Why is Best Buy’s adoption of QR Codes Important? Are QR codes merely a gimmicky experience that very few shoppers will actually use in the store? Today, only a small number of US shoppers will recognize the QR Codes in Best Buy, let alone have the proper hardware and software to use them. Even the shoppers that embrace the technology won’t always get a perfect experience. But as Wayne Gretzky once said, “A good hockey player plays where the puck is. A great hockey player plays where the puck is going to be.” In the case of retail, it’s VERY clear where the puck is going to be. A majority of consumers are doing on-line research before making purchases in store. The majority of all on-line activity will soon be on the mobile device rather than the computer. A majority of shoppers already use their mobile devices on their shopping trips. If you are a shopper marketer and you aren’t thinking right now about how shoppers are going to use mobile technology to make their purchase decisions, then I have a travel agency, a book retailer, and video rental store to sell you! By being a first mover, Best Buy is earning valuable mind share for their brand. They are rapidly learning what tools, systems, and processes it will take to deliver a winning shopper experience. If you aren’t looking at your own retail strategy for opportunities to take advantage of this emerging trend, you ought to at least be trying to learn all you from those who are. What is the actual customer experience for Best Buy’s QR Codes? 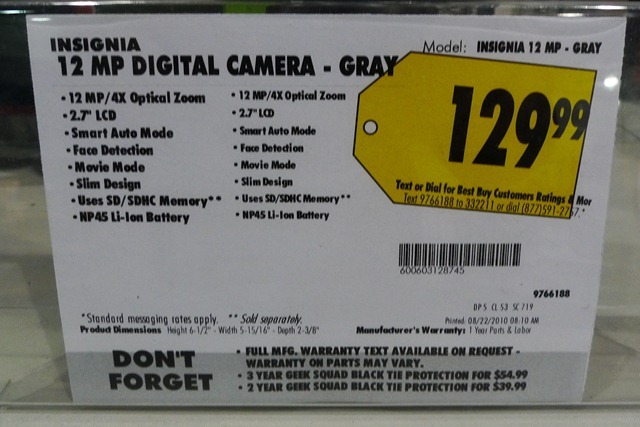 Best Buy has improved their fact -tags for most product categories, including the addition of QR Codes. Bullets with key product features have been replaced with easy to understand icons. It’s now much easier to find and compare key features such as the number of megapixels, type of memory card, etc. The new fact tag now includes the average customer rating (1-5 stars) that the product has received. The fact tag now includes the QR Code which can be scanned by the shopper’s mobile phone. Something to note about Best Buy’s fact tag:.Each Best Buy store reprints all their fact tags frequently to ensure each item displayed is at the current and correct price. Take a look: the date and the time the fact tags were printed is shown right there on the tag. If these tags are reprinted twice a month that means that Best Buy is printing over half a billion tags every year across all its stores, as well as paying for the labor to print and install them! That’s approximately $312 million dollars in fully-burdened labor just to keep up fact tags (and that’s not including any printing or infrastructure costs). That very large expense is why I believe retailers will ultimately adopt digital fact tags… if for no other reason than to reduce the labor cost. The customer can use the QR Reader on their smartphone to get detailed information about the product they are considering. They can read consumer reviews, compare features with similar products, and e-mail details to a friend who might be giving advice. If you have an iPhone with the free Best Buy app installed, you can use the QR reader built directly into the app. The experience using the app is slightly richer than using the mobile webpage. 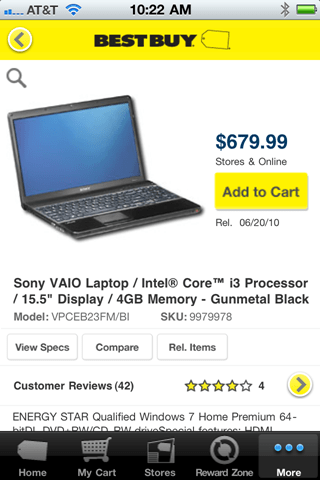 How good is Best Buy’s QR Code implementation? The smaller the payload is from a QR Code, the easier it will scan, so Best Buy used short codes to keep the payload as small as possible. QR Codes resolve to URLS such as http://bby.us/?c=BB014229843853. When your web-page goes to that address, it gets converted to the longer m.bestbuy.com version. The mobile pages are properly formatted to be legible and work well on mobile browsers. The mobile webpage has a rich feature set. The first 4 digits of the payload URL “1422” are actually the store number that the QR Code is the shopper is in! That means that Best Buy has wisely assigned each store its own QR codes. 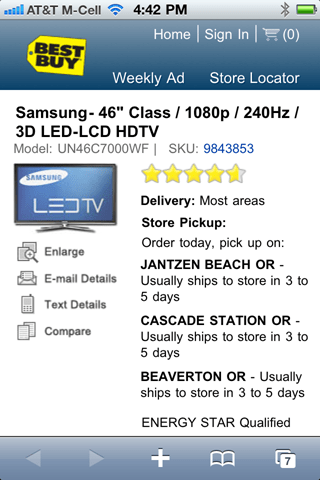 Using whatever web analytics package Best Buy uses, they can see which SKU’s are being scanned in which stores. It also means the customer experience can be customized to a particular store (the product information could include how many are in stock, who the manager on duty is, etc…). Best Buy offers the richest experience possible for each mobile platform and degrades gracefully. If you have an iPhone running Best Buy’s app you get a completely custom experience. If you have a smartphone with a generic QR Code reader, you still get a good experience, and even if you have an older phone with no camera, you can still use the TXT messaging experience. Although the QR Code is unique to each store, right now they are sending visitors from every store to their generic mobile website which does not know you are in a store at all. It not only doesn’t tell you if the product is in stock in the store you are in, it doesn’t offer to direct you to a nearby store. 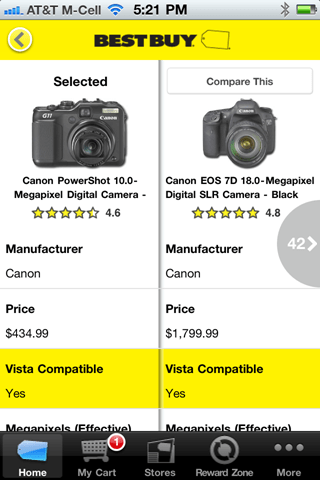 Best Buy’s website sometimes offers different pricing than the store. 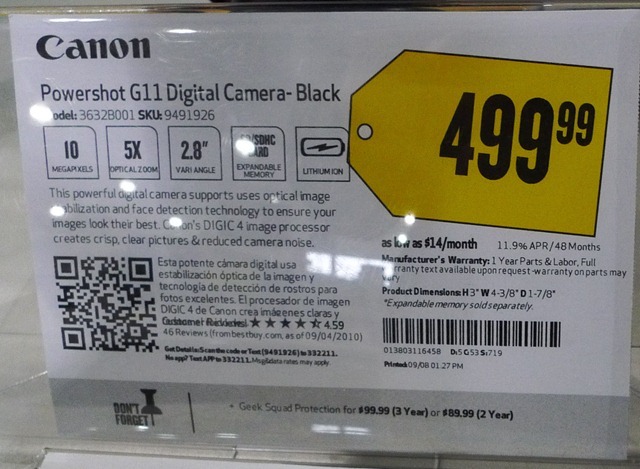 Because the QR Codes take shoppers to the generic mobile website, it means they might see a different price than the in-store price (notice in the adjacent photo that the phone offers a price of $439 while the fact tag says it’s $499). The Best Buy iPhone app has some problems. It’s brilliant that Best Buy offers the app and tries to keep all the important shopping experiences in their own app. But shortly after the QR Codes were launched nationwide, Apple updated it’s iOS to 4.1 which broke the QR Scanning feature in the app. 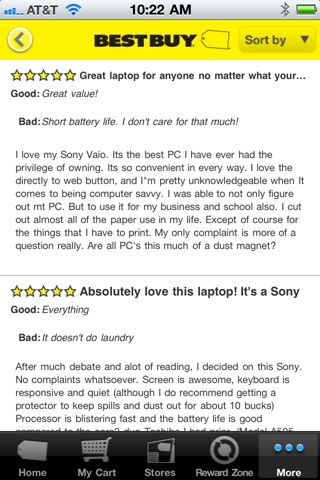 Best Buy rushed out a patch, but it still can be quite a bit slower than a good dedicated reader. Now that Best Buy wants shoppers to use mobile technology in the store, they need to offer free Wi-Fi to make those experiences faster and better. Where are the social networking features? What if a shopper wants to tweet a cool product to her friends, or post a new TV she is thinking about buying to her Facebook page? That isn’t offered in the app or via the mobile website. It’s still technically not permissible for shoppers to take pictures inside a Best Buy store, which makes all this effort seem silly. If Best Buy has changed this policy they haven’t done a good job of communicating it to the “Blue Shirts” or even the Store Managers. As a matter of fact the ones I spoke with while researching this article still all think it is not allowed. (NOTE: Most of the employees I encountered showed good judgment by not trying to enforce this rule). See my previous post on the topic: Please Don’t Have Fun In Our Store. What is the Future of QR Codes at Retail? QR Codes are already very popular in Asia, and, as mobile becomes the dominate platform for accessing the internet, I expect we are going to see them more broadly used .Ultimately, I’d love to see paper Fact Tags replaced by digital Fact Tags such as those offered by MicroSigns. Retailers could even offer built in NFC transmitters to interact with shoppers’ mobile devices (For example, imagine Digital Fact Tags that could instantly change colors to highlight the products that best matched a search you performed on your phone). If it does happen it might take some time For retailers, QR Codes are going to be the best and most popular option for the next several years. It’s usually much harder to be fast and nimble when you are a huge retail entity. Best Buy was one of the first retailers to experiment with Augmented Reality in their store circulars. They were amongst the first to use QR codes in their print advertisements. The first to embrace all of their employees’ participation on social networks. The first to use Twitter for customer support. The first to offer a TXT -based lookup service for products. Now they are the first to broadly deploy QR Codes in-store. It would be easy for Best Buy to sit back and let others blaze the trail, and plan to be a fast second mover when any of these marketing tools catch on. But what Best Buy seems to understand is that there are immeasurable learning that occur when you actually do this stuff It enhances Best Buy’s reputation as a destination for the latest technology, and most importantly, it fosters an environment of innovation for Best Buy employees. Like all large retailers, Best Buy has plenty of room to improve its customer experience, but it’s also clear that “Buyer Be Happy” is more than a clever marketing slogan. Yes, I remember the Cue:Cat too. I’ll have to try this next time I’m in BB. Really nice recap, Jason. I’m grateful for retailers like Best Buy who are demonstrating the practical application of QR codes in the retail environment. A friend recently visited a Best Buy store and noticed a QR code near the door. Scanning it resolved to a store locater feature, which hardly seemed necessary given that he was already there! Still, they are doing a great job and the app is very well done as well. Love that BB is using QR codes. Quite the change from the days when photographing a price could get you kicked out od the store. But we will still need apps like RedLaser or other UPC/GTIN scanners so that we can also find data not curated by the store itself. I will use both the QR tag and the UPC. Nice article. 2011 is going to be the year of the QR Code! I recently launched http://www.SocialQRCode.com, a QR Code generator tool designed for businesses to promote their social networks through QR codes. Turn foot traffic into web traffic for your fan page and twitter page. I’m really pleased with one of my favorite retailer ( @bestbuy ) evolving into QR. Not only does this allow consumers to get product ratings and spec’s on each product but it also allows interaction between the consumer and the retailer. I noted all the things good/bad #bestbuy did in implementation stage, but as you may know there is no perfection without making mistakes. It would be great if they were able to recognize when consumers were actually in store as there are many advantages to this, such as instant promotions/ price reductions. All in all I’m excited for my next visit and even more excited to see other companies follow their example once the success of this undertaking is quantified. U.S. retail may in fact still be a few steps behind Europe & Asia however this demonstrates that we are closing the gap. Don’t know if you spotted this before but every QR Code scan actually turns up on a public Best Buy site, showing what the item is and where it was scanned. Does Accessvia Designer supports for designing the QR codes. Which version supports the feature to design QR codes in a templates.